Hi guys! 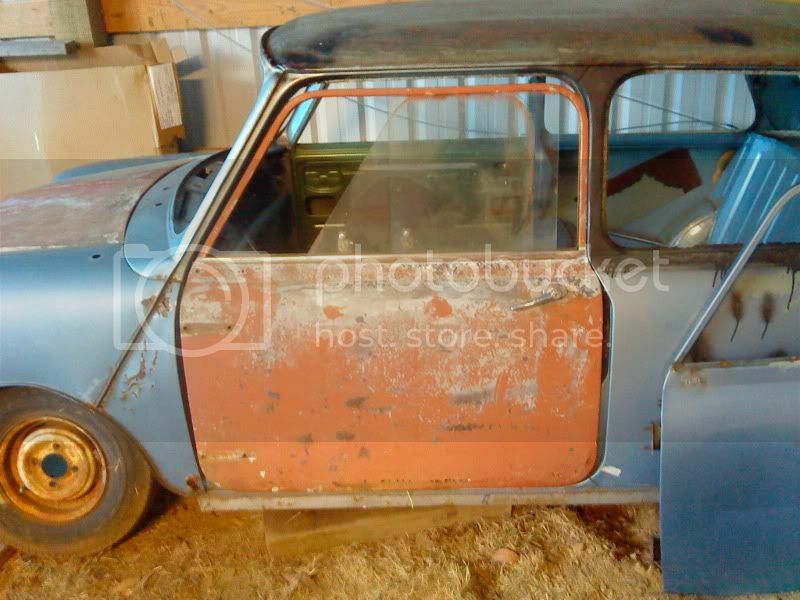 I'm looking to convert my 1980s mini into a mk1 replica.... what do I need to give it that mk1 look and how do I fit them, and where do I get the parts/kits from? I want it to look like the real thing so no cutting corners! Has anyone ever tackled this before? And after all this work, it'll still have an 80s numberplate. There are more things, but I can't think of all of them right now. If you do a search, there are very detailed threads on the matter. I want to know how I can fit the external door hinges as I've heard they are a real pain to fit. Also I don't know whether a mk1 bonnet and boot will fit on a 1980s mini...? Edited by harryh0803, 16 May 2014 - 06:50 PM. You can fit fake hinges but imo they look terrible, im sure with some expert welding skills you could fit mk1 doors and a panels etc but it would be a right pita no doubt. Hello Harry, to your question about the MK1 Bonnet I think the hinges are different so its usually more straight forward to grind off the lip on your existing Mk3 bonnet if I recall right. The boot shouldn't be too difficult it pretty much just sits where your MK3 boot does. You will need to buy some MK1 doors also but you can use the doors from the Mini vans too as they had external hinges. There's a few going on ebay at the moment so you might want to check them out. You may have to get some MK1/2 A panels also. Most of the conversion is pretty straight forward if you know what your doing the most awkward part tends to be the external door hinges that can be a slight bummer lining it all up but pays off in the end. Anyhow best of luck with your conversion if I've got anything wrong someone's bound to correct me so don't worry!! With the doors it's not just the hinges the locks are different as well, plus the door curves instead of having sharp courners, I've fitted mk1 hinges on carbon fibre doors to my mini, I wish I'd not bothered. To much of a pain to do. Thanks guys! Devo that's a big help thanks. Danny, can you post some pictures of your external door hinges on your mini? Carbon fibre doors sound awesome too! No don't look at mine!!! . iAs above its a big job for little reward, but making it Look like a mk1 on the outside is a better option. I can't find your thread Danny!! Like has already been said above, fitting Mk1 doors will require replacing the door aperture frame and step, the b post, modifying or changing the quarter panel, fitting Mk1 inner and outer A panels not to mention all of the modifications to the shell to get these panels to fit nicely. Then there is the headache of modifying the rear panel to take the smaller rear window, modifying the front panel to have the curved ends on the apron and a whole load of other bits and bobs. Look forward to seeing what you decide on. Doesn't put foot in mouth enough! There is a huge amount of work fitting the mk1 doors in a later shell as detailed above. Just stick it down on 10's loose the arches.... take the lip off the bonnet and fit a mk1 grill & surround then you have the mk1 look without too much hassle... and if you want, fit a MK1 boot and put in conversion plates for the rear light clusters, but make sure that you still retain a fog light as it's still a 1980's mini. Even some over riders are a cheap way to get the period look..